For the second time in three weeks, Michael Thompson is facing a US Open golf course under US Open conditions. 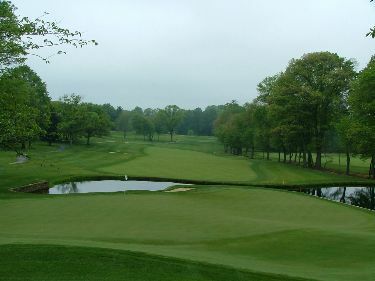 This week, instead of the actual US Open, Michael is competing in the AT&T National at the Congressional Country Club. Dry, hot conditions have the course playing harder than it did during last year's US Open when Rory McIlroy won with a score of 16 under par after rain softened the course considerably. This year, Congressional is under a heat wave and it is punishing the field. My score today wasn't all that bad considering the conditions. It's playing like a U.S. Open. I think these are the conditions that the USGA wanted last year. The heat is going to affect a lot of players. It's hot, especially when you're wearing these pants. I've been living in the South long enough to where I should be used to it, but it does sap your energy. You definitely have to drink a lot of water. I probably drink a bottle of water every two holes. Michael tees off from the first hole at 12:00pm ET with Tom Pernice Jr. and Sung Kang. The Congressional Country Club in Bethesda, Maryland will be hosting it's first PGA Tournament since last year's US Open. Due to wetter than normal conditions last year, Congressional played much easier than the USGA would have liked for a US Open. For this year's AT&T National, don't expect scores to be so low. 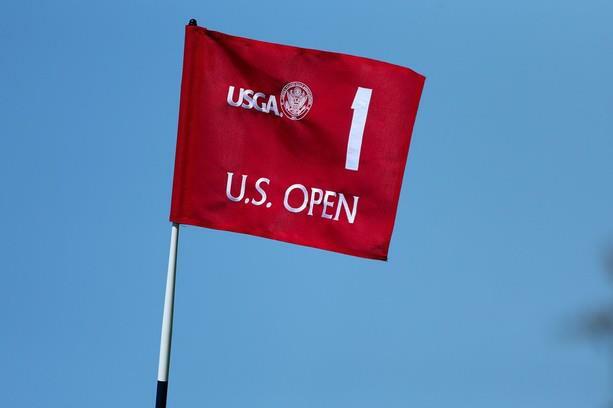 Hard, fast conditions are expected and many expect that typical US Open-like scores will follow. Michael Thompson will be teeing off in the first group of the day with Tom Pernice Jr. and Sung Kang. The trio will be teeing off from the par 3, tenth hole at 7am ET. As Randy and I scour the Internet for articles and material for the Thompson Tide, we occasionally come across stories of how Michael has made someone's day a memorable one. These stories are always my favorite. If you've ever been to a PGA Tour event with Michael you know that this story is not unique and not unusual but is newsworthy in its sincerity. The following story was posted on gazette.net, a website for local Maryland news. I've pulled out the first few paragraphs and provided a link to the full story...enjoy! Matthew O'Connor turned around and flashed a 1,000-watt smile to the group of autograph hounds behind him at the 18th green at Congressional Country Club, proudly holding up his newest souvenir: a signed glove from Michael Thompson. The 9-year-old from Potomac had been holding out his yellow AT&T National flag in hopes for another of what would wind up being more than a dozen signatures he would get throughout the day, returning instead with the autograph as well as Thompson's signed FootJoy glove. Thompson hung around with the group of 10 or so beaming kids, chatting and signing and tossing out a few brand new balls before hopping on a cart back to the putting green during Tuesday's practice round for the AT&T National, which begins Thursday. 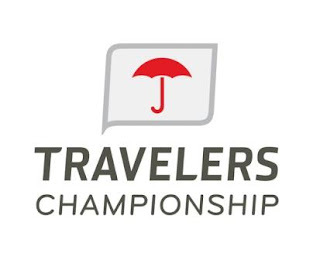 Michael Thompson missed the cut last week at the Traveler's Championship but that gave him a couple of days off to rest and recuperate after a hectic week and a half. He gets after it again this week at the AT&T National. Last year, Michael tied for 38th at this event but it was held at the Aronimink Golf Club. This year the event moves to the historic Congressional Country Club in Bethesda, Maryland. Technically, summer solstice came on Wednesday but for Michael Thompson the longest golf day of the year might have come on Thursday. He shot eight over par which has him in a tie for 149th. But tomorrow is another day and Michael is sure to have put Thursday's round behind him. This week's tournament will be covered by the Golf Channel and CBS. 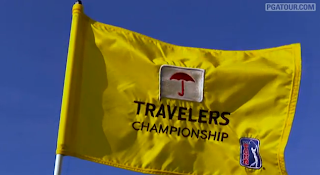 In addition, PGATour.com's Live @ streaming will be on the air covering all groups through holes 15 and 17. After his career best second place tie last week at the US Open, Michael Thompson is headed into the first round of the 2012 Traveler's Championship with momentum and solid history in this event. Michael finished fourth in this event last year when he posted a closing round 62 which gave him the clubhouse lead after four rounds for the first time in his PGA Tour career. He had a similar result last week when he was the clubhouse leader for 90 minutes before Web Simpson knocked Michael from the top spot by a single shot. Michael will have to deal with the added media attention and high expectations that come with world wide scrutiny but based on interviews he did early in the week, he seems ready for the challenge. "The key to playing good professional golf is you can't think about what everybody else wants or expects you to do, and I have trouble of falling into that trap of trying to live up to the expectations that I believe others are putting on me. It's not that people actually tell me go win or that we expect you to do this and that, but we as golfers put a lot of pressure on ourselves to begin with. We don't need all that extra pressure from the outside world. In a sense we kind of almost need to distance ourselves and really stay focused on what we want to do as individuals and our goals and stick to our process and keep it one shot at a time, one day at a time. And the more I can do that, the better off I'm going to be. Last week's over for me. The moment I showed up for the charter Monday morning I was already trying to get my mind ready for this week because it's a new week, it's a new opportunity. I've gotta go in this week with no expectations. Just because I finished well last week doesn't mean I'm going to play well this week. Golf is a game where there's a lot of ebbs and flows, and you really want to try to ride the flows as much as you can. But you also have to understand that the low points are going to happen, and I might have a terrible week this week. I have no idea. But if I go out and do my drills on the driving range and on the putting green and focus on my chipping and really learn the feel of the golf course, then most likely I'm going to have a good week. And a good week to me might be different than a good week that you expect of me or that somebody else expects of me. So again, I have to keep my expectations in check and just go out and play. " Michael will be playing the first two rounds with Bart Bryant and Matt Jones. They tee of from the first hole at 8:18am ET. This week's tournament will be covered by the Golf Channel and CBS. In addition, the PGA Tour's Live @ streaming will be on the air covering all groups through holes 15 and 17. With success at the US Open, Michael has garnered quite a bit of additional media attention this week. It came in the form of interviews, feature articles, notice from the fantasy golf world and even radio sound bytes. To start the week, he was one of the featured interviews at the Traveler's. You can catch pieces of the interview below and a full transcript is provided after the video clips. Michael got some nice press in several articles this week. The following section will have links to some of them. Michael committed to play in several tournaments this week and the tournaments are using the news to draw interest. Here are articles on the RBC Canadian Open and the John Deere Classic. The Fantasy Golf world has taken note of Michael's recent success as well as his past success at the Traveler's. In fact, he was the first pick in the Expert Picks competition on PGATour.com meaning he was chosen before any other player in the field. This is the first time he showed up in this column. He was also listed #12 on Rob Bolton's Power Rankings column on PGATour.com. He had previously made Rob's Sleeper Picks column a couple of times but this is the first time he made into the Power Rankings. 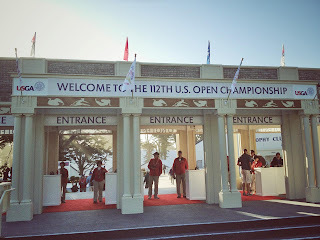 When my sister and I arrived at the Olympic Club on Sunday to watch the final round of the US Open we knew that scoring was going to be tough. A large fog bank had enveloped the course and was being blown by steady gusts off the ocean. 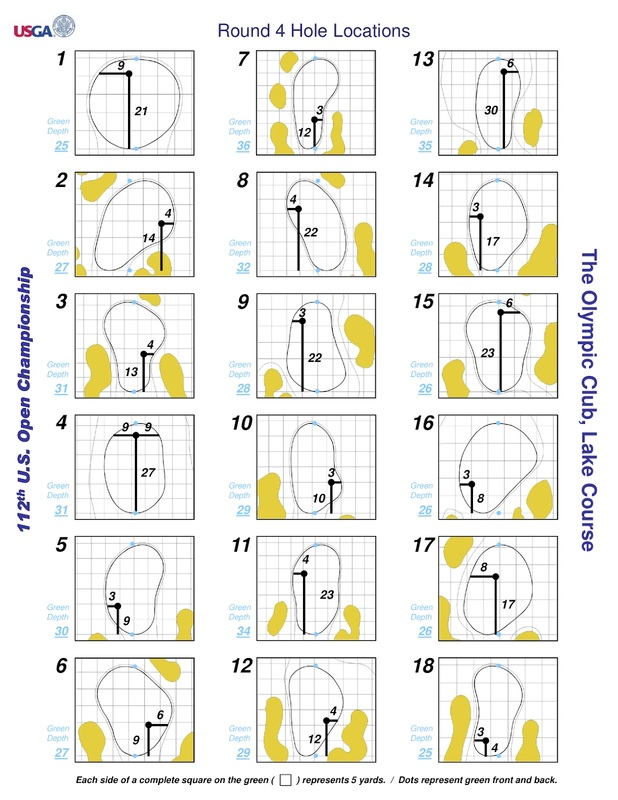 Add to that, the hole locations for round 4 were once again expected to provide a challenge. Our goal for the day was to watch as much of Michael Thompson's round as possible. Since Michael started the day tied for 18th it didn’t appear there were many cameras following him so I’m assuming most of you didn’t get many details on his remarkable round. Here are my recollections of how it played out. I apologize for any mistakes but I wasn’t taking notes – I was enjoying the experience. Also, if you really don’t want to read a blow by blow description of Michael’s round you should probably stop reading right about now! And one more disclaimer, any distances I use are purely estimates on my part and in some cases my view was not the best. Michael Thompson had just come off a round of four over par (74) in which he struggled to keep the ball in the fairways. As he teed off on hole #1, things definitely started off on a positive note. His drive split the fairway and was long. His approach shot to the first green got an unlucky bounce as it hit the right side of a swale just short of the green and bounced right of the green and into the rough. A beautiful chip out of the rough came to rest three feet from the hole which was cut in the back left portion of the green. He made his par putt and the best round of the day was underway. Michael’s tee shot on number hole #2 leaked into the left rough and was probably pushed that direction by the prevailing winds. Michael’s second shot from the rough found the green and he two putted for a nice “easy” par. After watching David Toms push his tee shot into the left bunker, Michael was able to find the green as his tee shot landed short and carried up into the front center of the green. That left him with an uphill 25 foot putt to a hole cut on the right. Michael’s putt carried good speed but didn’t go in but once again he had a tap in par. David Tom’s was able to get out of the bunker and save par as well. The tee shot on the fourth hole is elevated and drops to a fairway that slopes severely from left to right. Michael’s tee shot landed in the fairway but took the slope and rolled into the primary rough. Michael’s second shot from the rough landed on the left hand side of the green but the green’s were firm and the ball skipped through the green and off the back side shaved bank. The ball came to rest on the bank about 30 feet from the hole. Michael’s third shot required him to navigate a hump and then a double break towards the hole. Rather than chip from off the green, Michael pulled out his favorite club – the putter, and played a links style shot that climbed the bank, turned around the hump and then fed down the hill to come to rest around four feet from the hole. Michael made the par putt and was even through the first four holes. The tee shot on hole #5 is also elevated; so much so that you can't see where the ball ends up from the tee. After Michael struck a perfect tee shot, he took a second to point and us (the Thompson cheering section) and tell us "to keep it down". He had a big grin and it was obvious he was relaxed and having fun which was one of his main objectives for the week. His second shot landed on the front of the green around 25 feet from the hole. I managed to get into the bleachers on this hole and had a great look at his birdie putt. When Michael hit the putt I was convinced it was too high because it just didn’t seem to break to the hole as much as he hit it. Even as the ball was three feet from the hole it looked like it wasn’t going to go in but when the ball got to about 2 feet it was slowing down and it basically made a left hand turn and did a 360 twirl into the hole. The putt must have broken 3 or 4 feet but Michael played both the line and the speed perfectly. It was the first time Michael had reached red numbers on the day. To tell you the truth I don’t really have a strong recollection of this hole. I remember his drive found the fairway again and I think he hit the green and two putted for par but don’t hold me to this one! This hole was interesting because it was a drivable par 4 but it had terrible site lines for anyone who wasn’t in the grandstands. According to Michael’s brother (who climbed into the grandstands to take a quick peek), Michael’s tee shot came up just short of the green in the fairway. He chipped to about 5 feet from there and made the birdie putt to move to two under par. At this point in the day, Michael was the only player on the posted leaderboards under par. One of my favorite moments of the tournament came on this hole on Friday when Michael did a "happy dance” after making a birdie to finish his round. On Sunday, his tee shot landed at the back right part of the green on the same level as the hole which was in the back left of the green. Michael’s birdie putt came up about four feet short but he was able to make the par putt and move on to hole #9 at two under par. Michael’s lone wayward tee shot came on hole #9. He ended up way left beyond the primary rough and near a trash can. The lie wasn’t too bad as this area was basically trampled down due to the foot traffic. However, he was buried behind a large tree with low overhanging branches. He tried to hit a low screamer under the tree and run it up the fairway as far as possible but it didn’t get enough altitude and buried in the primary rough about 20 yards from where he was. I couldn’t see the ball because the rough was so thick and the ball sat down. Somehow Michael hit his next shot from the rough onto the front portion of the green. He left himself about a 25 foot par putt which he gave a valiant effort. I was fairly far from the green but you hear those famous US Open groans and you know it came close but didn’t go in. He tapped in for bogey. It was the lone dropped shot on his card for the day. On a side note, this hole provided one of the more unusual moments of the day as a rules official sprinted up to Michael to speak with him as he was walking up to the green. We had no idea what the problem was but when we asked him about it later Michael said that the official asked him if one of the spectators had moved his ball while it was over by the trash cans. The answer was “no”. Michael once again continued his magnificent day off the tee as he hit his tee shot on hole #10 into the left side of the fairway on the dog leg right hole. He was in a good position in the fairway but his iron shot found the left greenside bunker. He made a great bunker shot that landed within two feet of the hole and he tapped in for par. Once again, Michael found the fairway and then hit his second shot to about 8 feet. Unfortunately this was another hole where we were standing below the hole so I didn’t have a great view but Michael dropped the birdie putt and once again moved to two under par. It was about this time that a bunch of photographers and camera guys started following the group. Michael played this hole almost as a carbon copy of hole #12 with the exception that he left himself about about a ten foot birdie putt. The putt just slide by the hole and he tapped in for par. This hole has a very tricky green with a left edge that slopes off the green into a shaved fairway. The hole was in the back right on Sunday. Michael’s tee shot landed short and left and looked like it was going to stay on the green but just as it looked like it had stopped rolling, the hill took it and it rolled off the green short and left of the hole. Michael pitched out to about four or five feet. He took a long time over this putt but when he eventually pulled the trigger he drained it to save par. This hole has an elevated tee and the fairway has a dog leg right but large trees down the right side and some very strategically place trees on the left side. Michael’s drive found the fairway. His second shot was online but came up just short of the green in the fairway neck of the green. He putted from the fairway and the putt was right online but came up just a tad short. He tapped in for par. We got stuck on the other side of hole #16 so I didn’t get a good look at this par three but Michael’s tee shot landed on the green about 10 feet from the hole. He just missed the birdie putt and tapped in for yet another “easy” par. If you followed the tournament, you know about hole #16. It was the longest par 5 in US Open history measuring a mammoth 670 yards. On Sunday, they moved the tee up so it was only 575 yards. Michael’s tee shot was long and straight and found the center of the fairway. He hit his second shot into the fairway with about 80 yards remaining. His wedge into the green was hit perfectly and stopped on the green about five feet from the hole. He made the birdie putt and was three under par on the day and two over for the tournament. Statistically, hole #17 was the easiest hole on the course for the field but for Michael 17 seemed a bit of an enigma. On Friday and Saturday his tee shots were left of the fairway and had tree problems. On Sunday, his tee shot missed the fairway to the right but at least he didn’t have to contend with trees. The ball came to rest in the primary rough. 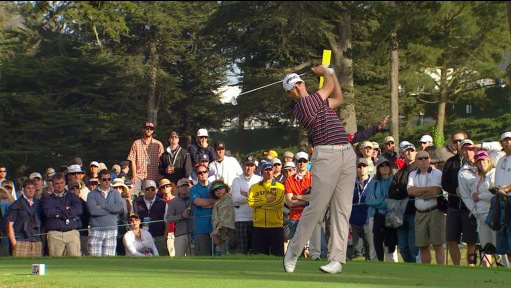 He laid up into the fairway and then hit what he described as his best wedge shot of the tournament. He landed the ball just past the hole and got it to spin backwards leaving himself an uphill birdie putt of about five feet. Michael missed the birdie putt but was able to tap in for par. Michael later he said that he didn't go through his entire pre-shot routine over the birdie putt and he said "I pulled it as soon as I hit [it]." I’m sure most of his 18th hole was covered on TV (I still haven't had a chance to go back through the DVR coverage) but here is how it played out. His tee shot went right into the tree line but he got a kind bounce as the tree kicked the ball back into the fairway. He had a longer than normal iron shot into the green. His shot into the green caught the right rough just off the green but it was hole high. The hole was cut in the front left just thee paces over the front bunker. Michael’s chip from the rough didn’t quite break enough but he had an easy tap in to finish his round at three under par (67). As a cheering section, we convened in the clubhouse to see how the rest of the tournament played out. I didn’t think two over was going to be enough but as the day wore on and guys kept falling down the leaderboard, it looked better and better. We were excited because we knew that Michael had accomplished several things no matter where he ultimately finished: he had locked up invitations to the 2013 US Open (top 10 and better) and the 2013 Masters (top 8 and better), he had also pretty much locked up his 2013 PGA Tour card and an invitation into the PGA Championship later this year. Michael had to do several interviews but eventually came and sat with us as we watched the end of the tournament. 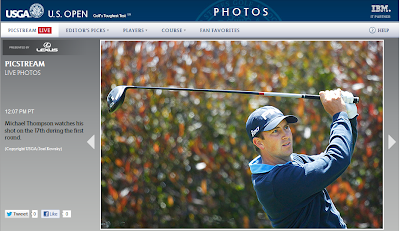 As you know by now, two over came in second by a shot to Webb Simpson. After the tournament was over, Michael told us to come down to the 18th green. He was presented with a silver medal for being the US Open runner up. It brought to mind the medal ceremony I got to witness when they presented Michael with his low amateur medal in the 2008 US Open. The big difference was the size of the crowd. In 2008 there were about 20 people around and this time there were thousands. 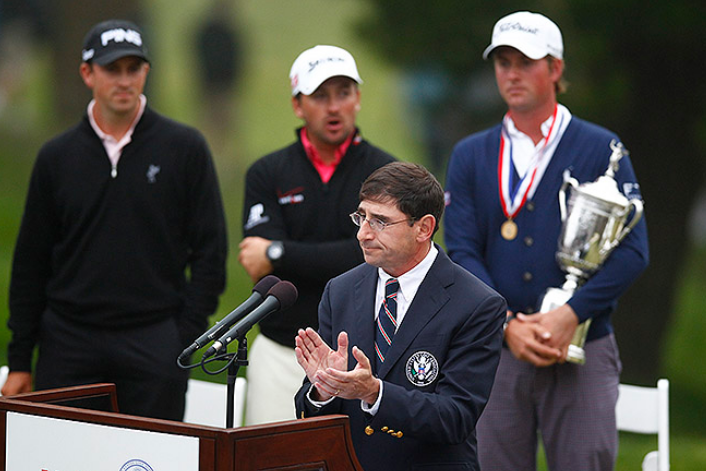 In either case, it was very cool - even with the “chicken guy” who interrupted Webb Simpson and Bob Costas. So this article might have sounded like Michael played the par fours as "fairway-green-two putts for par" - what's so hard about that? First of all, hitting fairways on this course was no easy feat. Trees hugged fairways or overhung them entirely. Hills and slopes wanted to take balls from the fairway into the rough. In order to hit a fairway you had to shape the ball and land it in a very narrow window. Some holes you had to shape right to left, others it was reversed. On Sunday, nobody did it better than Michael. Michael hit 11 out of 14 fairways to lead the field. Add to that that I used the term "easy" par several time throughout this post. In reality there were no easy pars on this course. Any putt longer than 18 inches was a challenge. Michael lead the field in putting for the week and I don't remember him missing a single putt inside of five feet. No words I give you will accurately convey just how good a round Michael played on Sunday. It was a thing of beauty. When you add the situation on top of that - the final round of the US Open - it is just all the more impressive. It was great to see him come back from his rounds on Friday and Saturday where he was grinding. For those of us following, it was just an amazing day. We were (and still are) just so happy for Michael to perform as well as he did. And the best part of it? He had fun doing it! Michael Thompson had the best round of the day, a 3 under beauty that vaulted him up the leaderboard early. As the rest of the golfers ahead of him played the tough 1st through 6th holes, they slowly dropped and came back to where Michael was on the leaderboard. After it was all said and done, he finished tied for 2nd with Graeme McDowell, one shot behind the eventual winner Webb Simpson. He had the best score of the 1st and 4th rounds and had the most birdies of anyone in the field. With the T2 finish, Michael earned $695,916, locking up his 2013 PGA Tour card and earning an invite to the 2013 Masters and U.S. Open. He also moves from #107 to #52 on the OWGR list, #105 to #39 on the money list, and #90 to #39 on the FedEx Cup list. All in all, I'd say it was a great Sunday! Michael's parents and in-laws were present this week. We can check "fathers day gift" off his list now. Michael hit the most fairways of anyone on Sunday. 11 of 14. This was key since he had been struggling in the second and third rounds trying to do so. He ranked 41st overall. Michael ended up shooting four over par in the third round of the US Open. He'll be going into the final round T-18th at +5. "Michael's birdie on hole #1 was nothing short of remarkable. His drive off the tee went far left into what looked like a dirt patch beyond a tree line (we were on the other side of the fairway). The crowd cheered his save out of the native area but he just got back into the fairway and had 100 yards or so left to the hole. I was up at the hole and his wedge shot landed softly short of the green and just started tracking right into the hole! It was the most amazing shot I have ever seen live. The gallery went nuts!!!! I hope they had it on TV because it was so good that I want to see it again. It definitely wasn't the way you'd draw up a birdie on that hole in the game plan!" They did have it on TV, but it hasn't been available online anywhere, so I uploaded the clip. I found this interview on youtube which was done thursday night. It's a pretty good interview and worth watching. I have no idea what was on TV but there was a camera filming every shot of the day. Big crowd following early but as he fell down the leaderboard the gallery got smaller and it was easier to follow. The course has some crazy cross-overs between holes so it was sort of hard to keep up with the group at points. Michael said that the greens were super hard. You had to land the ball up to 20 or 30 yards short of the green on some shots to get the ball to stop on the green. At the end of the day there were a lot of spike marks that made getting the ball on the line he wanted difficult. You wouldn't believe how fast these greens are. I don't think TV does the slopes justice. There were putts that Michael barely touched that traveled 20+ feet and well past the hole. The double bogey on 18 comes to mind. Michael played the tough stretch of 1-6 at 1 over par. He had two bogeys and both were 3 putts. He missed some fairways in this stretch but I think he hit all of the greens in regulation. The birdie at the last was definitely a confidence booster. Michael was very upbeat after the round and said the course was "ridiculously difficult". He said it played completely different from day 1. That might be a result of playing in the afternoon. Don't know if they showed it but his tee shot on 8 looked like it ended up about 3 feet from the hole. Even that putt Michael said was difficult because it was down hill side slope and there were a lot of spike marks in his line. He decided to hit it firm. He also told his caddie, Mattie Lou that he was going to celebrate if he made the putt - thus the happy dance at the end of the round. It was funny because it was out of character for Michael but I think it showed he was having fun. If you blinked, you would have missed the celebration, so here's the clip. Michael Thompson's day got off to a rough start. 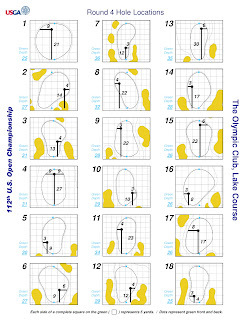 Missing fairways and ending up in the punishing rough made it an Olympic marathon type of day. Michael fought back though, ending the day tied for fourth at +1, two shots back from Woods, Toms and Furyk. As usual, Michael sounded upbeat in his press conference and is looking forward to battling the tough course at Olympic. "I am not a pushover by any means. I don't believe I'm that way, and so I've always prided myself in going out and being competitive and never giving up; and in a U.S. Open it's a perfect example of the person who doesn't give up usually finishes really well." Tonight while watching the US Open coverage on the Golf Channel, they started to talk about Michael Thompson and what kind of a guy he is. In 2.5 minutes they gave a really clear picture of who he is and what kind of character he has. Since this type of thing never gets put on a highlight reel, I thought it was important to share it. If you'd like to watch the clip from the Masters that they were talking about you can click here. Shooting -4 at the US Open gets you some attention. Wow! What a day we Michael Thompson fans have had. 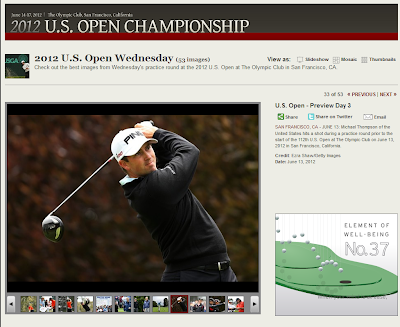 By now, you've probably heard that Michael finished the day in 1st place at the US Open. He shot four under par, which is rather remarkable considering only five players finished under par. I'll be posting links to all the articles and photos I can find. Keep coming back throughout the night as this post will be growing. Michael will be teeing off from the ninth hole on Friday at 12:52PT for his second round. He will once again be playing with Steve Marino and Colt Knost. Scoring LinksYou can follow online with the following links although there isn't a ShotLink style shot-by shot update like a normal PGA Tour event. Roz will hopefully be Twitting updates from the course tomorrow if he can get his phone through security! By the time you read this, Michael Thompson may have already teed off in his first major as a professional golfer. In many ways, he's come full circle, as it was at the Olympic Club that he finished as runner up to Colt Knost at the 2007 US Amateur. 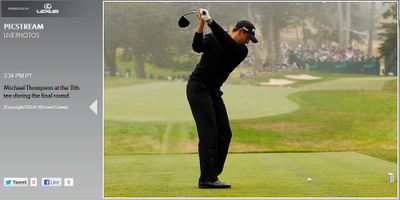 With the 2nd place finish he earned a spot in two majors: The 2008 US Open at Torrey Pines and the 2008 Masters. He played both as an amateur before he turned pro. It sounds like Michael will have a good contingency of friends and family rooting him on this week. The other half of ThompsonTide.com, Roz, is flying up on Thursday along with his family, and my sister Dawn will be attending as well. I also heard that Michael's parents will be there to root him on, as they did at the 2007 US Amateur. Roz will probably be tweeting updates as he's on the course on friday and hopefully saturday as well. Michael tees off at 7:37 PST along with Colt Knost and Steve Marino. 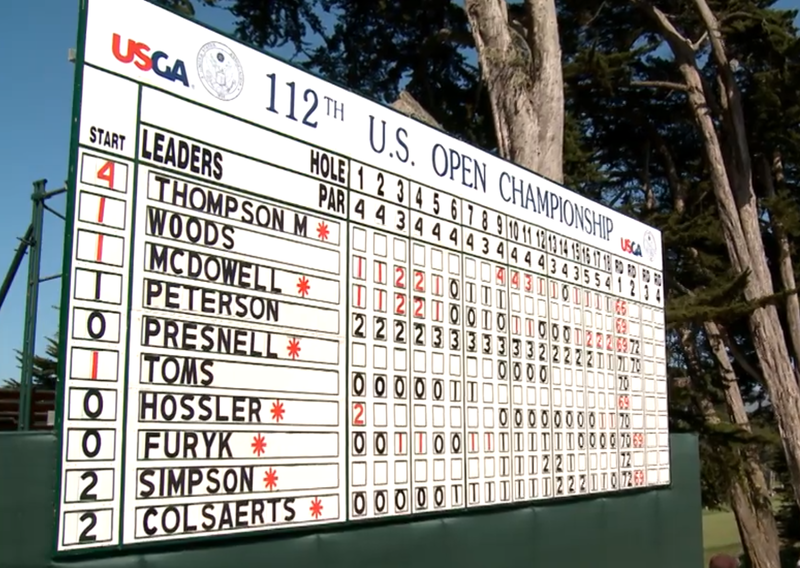 However, the USGA does have a "Play Tracker" which is pretty good. Michael Thompson was seen out on the Olympic Club's Lake Course earlier today in preparation for tomorrow's first round of the US Open. Michael will be teeing off at 7:37am PT with Colt Knost and Steve Marino from the first hole. 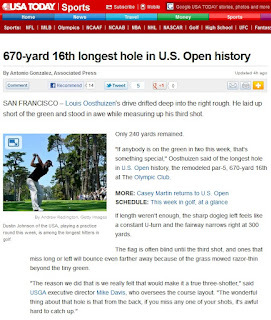 AP writer Antonio Gonzalez did a nice article on the par 5 16th hole at the Olympic Club which comes in at a whopping 670 yards. Michael is quoted mid-way through and it is worth a read. This version came from USAToday.com. RUNNER-UP RETURNS: The small silver plaques for runners-up inside The Olympic Club are often more recognizable than the posters and memorabilia of the winners. Names such as Ben Hogan, Arnold Palmer, Tom Watson and Payne Stewart adorn the walls for their second-place finishes. No, not from a U.S. Open. Back in 2007, Thompson finished runner-up in the U.S. Amateur championship at Olympic. He lost 2 and 1 against Colt Knost in a grueling 36-hole finale, and he hadn’t played a meaningful round on the Lake Course again until after he qualified for the U.S. Open last week. Thompson still recalls almost every shot from that taxing week. One of his shining moments came in the opening round when he beat Webb Simpson 5 and 4, shooting 5 under through the opening 14 holes, including a 15-foot birdie on No. 10. Thompson also made a 50-foot birdie on the fifth in the final. Michael finished solo 2nd at 142 over two rounds. 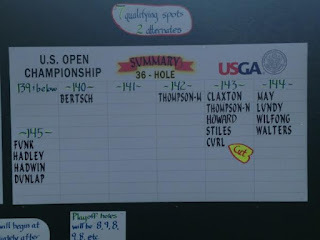 After posting the best round of the day (a four under par 68), Michael Thompson launched himself up the US Open Sectional Qualifier leaderboard in Rockville, MD and right into the 2012 US Open! He finished the 36 hole qualifier at two under par and finished second. Seven spots into the US Open were handed out at the Mid-Atlantic qualifier. After a first round 2 over par 74 which was good for a T22, Michael needed to post a low score to secure a spot. That's exactly what he did - posting a three under par front nine followed by a one under par back nine and climbing 20 spots up the leaderboard in 20 mph afternoon winds. 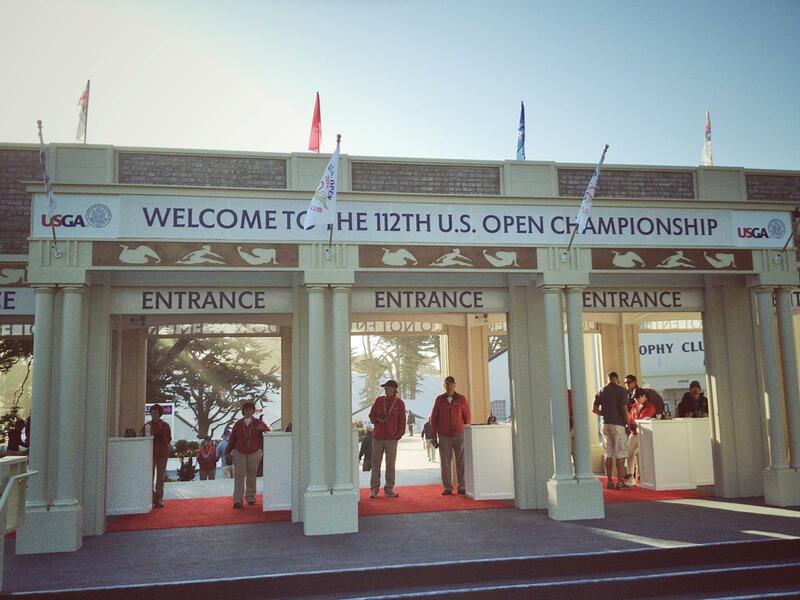 The US Open is being played at the Olympic Club in San Francisco, CA which is the site of Michael's second place finish in the 2007 US Amateur. The US Open will be Michael's first major as a PGA Tour professional but it won't be a new experience as Michael was the low amateur in the 2008 US Open in Torrey Pines. Only 7 players were under par at the Mid-Atlantic Qualifier. All seven qualified without the need for a playoff. For hundreds of golfers, both amateur and professional, tomorrow is a day in which dreams can come true or be put on hold for another year. Across the United States, sectional qualifying tournaments will be held to fill the field for the 2012 US Open. Each tournament will be 36 holes in length over the day with a coveted spot in the US Open awarded to the top players in each event. Michael Thompson will be playing in the sectional qualifier at the Woodmont Country Club in Rockville, Maryland. He will be competing with 77 other golfers for 7 spots. His first round gets started at 7:20am. Michael posted a second round of -4 and is in the clubhouse at -2. He is currently T2 and now has to wait to see if has punched his ticket to the 2012 US Open.